In the late 1800s a trio of British Rosicrucians/Masons formed a society devoted to occult studies. 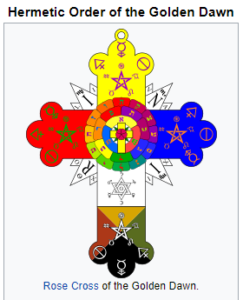 The three men, Woodman, Westcott and Mathers, named their secret society The Hermetic Order of the Golden Dawn. The influence of this society drove an ever-expanding interest throughout Western civilization in pursuing spiritual paths that were not aligned with any formal religion. The Order’s members focused on theurgy (ritual practices) and individual spiritual development. Many of their studies formed the basis of modern practices such as Wicca and Thelema (“Love is the law; love under will”). The Order’s members, not surprisingly given their innate individuality and personal eccentricities, developed factions and sectarian offshoots, but even so the subsequent influence of the one hundred or so initiates at the Order’s peak in the 1890s reached far beyond their restricted Victorian circle. Today you can buy tarot cards and books on divination at your local bookstore. One member of the Order was the poet William Butler Yeats. I’m headed off on a vacation to Scotland and Ireland, and hope to visit Yeats’s home while on my journey.